Adams County is known for its rural atmosphere, Amish community and the Great Serpent Mound. The Nature Conservancy’s Edge of Appalachia Preserve and numerous Ohio state natural areas and preserves offer relaxing and stimulating walks and unique natural features. Check out the Adams County Travel and Visitor’s Bureau for more information on events and things to do. Other great resources include the Hiker’s Guide to Adams County, Ohio and the Adams County Visitors Guide. The Amish community is centered on Wheat Ridge Road. You can tell the Amish farmhouses because there are no electric lines to them. There are a number of Amish shops and stores to visit. A favorite place to begin is Miller’s Bakery, 960 Wheat Ridge Road. The Great Serpent Mound, one of the largest and most renowned effigy Indian mounds in the United States, is located north of Peebles on SR 73. It was also the site of a major meteor strike that’s millions of years old. 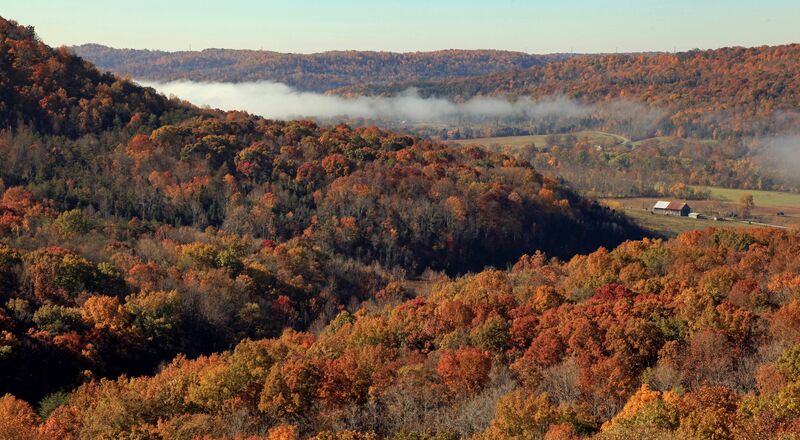 Owned by the Cincinnati Museum Center and the Nature Conservancy, the Edge of Appalachia Preserve offers hikes to Buzzardroost Rock, the Wilderness and Lynx Prairie, all of which are beautiful and interesting. The trail to Buzzardroost Rock is strenuous in parts; the Wilderness less so; Lynx is a walk in the park. Chapparal Prairie is close to Cave Hill, on Hawk Hill Road about two miles from the Lodge. It features a prairie remnant, with plants not ordinarily seen this side of Kansas, including Little Bluestem, Rattlesnake Master and False Blue Indigo. There is a ¾ mile gentle groomed trail leading though the prairie. Directions: Go down Cave Hill Road to Hawk Hill Road, turn right, travel about a mile and a half. The preserve is on the right. Chapparal is a good spot to visit if you don’t have much time. Adams Lake Prairie is about 6 miles from the Lodge, just outside West Union. It is a xeric prairie – very dry and parched open fields. There are stands of Prairie Dock, Blazing Star and bluets. There is a gentle ¼ mile trail. Davis Memorial is one of the most beautiful and interesting State nature preserves in Adams County. A stream runs though high limestone cliffs. One of the cliffs reveals a geologic fault where the strata have been displaced about 30 feet. Wildflowers adorn the cliffs. There is a 2 mile trail system with bridges, bulletin board, interpretive signs, boardwalk and parking lot. The trail is a bit steep at the beginning, then flattens out down by the creek. Directions: Left on Hawk Hill, right on Cross Road, left on SR 247, right on SR 32. From the junction of State Rte 32 and State Rte 41 south of Peebles, follow State Rte 32 approximately 1.2 miles east to Steam Furnace Rd. Proceed south on Steam Furnace Rd .3 mile to Davis Memorial Rd. Go left (east) on Davis Memorial Rd for 2.8 miles until reaching the parking lot on the right. This is a bit of a drive, but well worth it for the walk along the stream next to the cliffs. Shoemaker Preserve is a 22-acre site that protects several significant natural features including seven state-listed rare plants. It features two natural arches, dolomite cliffs and slump blocks harboring several species of ferns and other plants found in calcareous cliff communities. The preserve also protects both banks of Cedar Fork creek for nearly a half mile. There is a 1 ½ mile trail between along the rock cliffs and the creek. Directions: Left on Hawk Hill, right on Cross Road, left on SR 247, right on SR 32. From the junction of State Rte 32 and State Rte 41 south of Peebles, follow State Route 41 north to Portsmouth Road. Take a right on Portsmouth Rd., then a right on Pine Gap Road. The Preserve is at 165 Pine Gap Road. This is a lovely walk, not strenuous, along a pristine creek. The creek, Cedar Fork, is the same one that flows through Davis Memorial. The Quilt Barn Trail features a great variety of painted quilt squares applied to barns in Adams and adjoining counties. A drive around the trail is an entertaining and relaxing way to see the rural byways of Adams County. The Birding and Heritage Trail links great birding sites and historical places in Adams and adjoining counties.